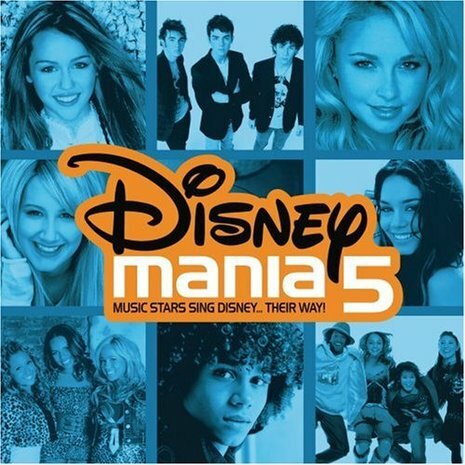 DisneyMania 5 is the fifth installment in the DisneyMania series. Its was released on March 27, 2007. The album features four of the stars from High School Musical: Vanessa Hudgens, Lucas Grabeel, Ashley Tisdale, Corbin Bleu and from High School Musical: The Concert, Drew Seeley among others. The album features other Disney-related stars as well. The album debuted on the Billboard 200 at 14 with a sales of 44,000 units, the highest debut for a Disneymania album to date. It has, since then, sold 293,000+ units. The Wal-Mart exclusive includes a card for a free download of bonus track "Goodbye" (Everlife).